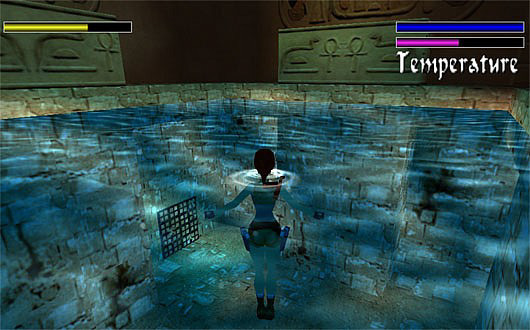 Ever wanted to watch Lara's temperature rise when she entered a lava room or watch it fall as she swims in icy waters? These things and more are now possible by using the script command. Scope: To use in [Level} section. The damage command allows customisation of the damage feature in damage rooms and of the game and the appearance and behaviour of associated damage bars. Without the damage command cold water rooms and damage rooms will work just as they did in the old game engine. This command uses several arguments; these are. Flags DMG_ This is equal to one or more values which determine the damage behaviour, a list of these flags can be found in the reference panel of the NG Centre. Several DMG_ values can be used together by separating them with a plus '+' sign, currently you can use the following flags. This flag will cause the damage bar to decrease but until it has reached zero no damage will actually occur to Lara; however once the bar is empty Lara's health rapidly falls with inevitable results. This flag restricts the damage to only occurring when Lara is touching the floor. For this reason it will be ignored in cold water rooms. It could be used to simulate an electrified floor, for example. To be used only with the DMG_INDIRECT_BAR flag. By default the damage bar starts full and decreases with time; using this flag forces the damage bar to start empty and fill over time. Used with a suitable text label this could be used to show increasing temperature. Use this flag to customise the cold water feature. If not used the setting will affect all damage rooms. Setting this flag will poison Lara when she enters a damage room. The effect is the same as when Lara is poisoned by a scorpion with the screen moving around. To be used only for waterless damage rooms. With this flag Lara will burn when the indirect bar, if present, is empty, otherwise when the normal health bar is empty. Must be used only with the DMG_BURNING_DEATH flag. Setting this flag will force Lara to scream when she burns. It will only work if the DMG_INDIRECT_BAR flag is also set, because without the indirect bar flag death is instantaneous and therefore Lara doesn't have time to scream. Used only with the DMG_INDIRECT_BAR flag. By default the indirect bar will disappear immediately when Lara leaves a damage room; with this flag set when Lara leaves cold water or a damage room the indirect bar will slowly fill and only disappear when it's full. Used only with the DMG_INDIRECT_BAR flag. If this flag is set when the indirect bar has fallen to 15% or less of its full value it will start to flash and a short beeping sound will be heard. If this flag is omitted the bar will flash but no sound will be heard. The value entered in this field determines the speed at which the indirect bar empties and therefore how quickly Lara is killed. Officially the value entered is the time in seconds, however in tests I have found the actual time for the bar to empty is equal to 2 * the value entered. This works like the above field but is the time taken for the bar to refill after Lara leaves cold water or a damage room. Where: RR = Red GG = Green BB = Blue intensity. This field is used to have a title for the damage bar appear in game below the bar, for example in a Lava room the bar could be labelled as 'Temperature' and could fill over time as Lara becomes hotter. The text you type into this field must also be present in the English.txt file in either the standard strings section or else in the [ExtraNG] strings section. This field determines the percentage at which the damage bar will start to flash; for example if you enter 30 the bar will flash when it has reduced to 30% or less. If you enter IGNORE in this field a default value of 20% will be used. If you don't set a Damage= command in the script the game engine will use these default settings. This screenshot shows the bars in action in a cold water room, the yellow bar on the left is the indirect damage bar, if this was removed from the script the pink temperature bar would also be removed. These are the script parameters used for the cold water room. 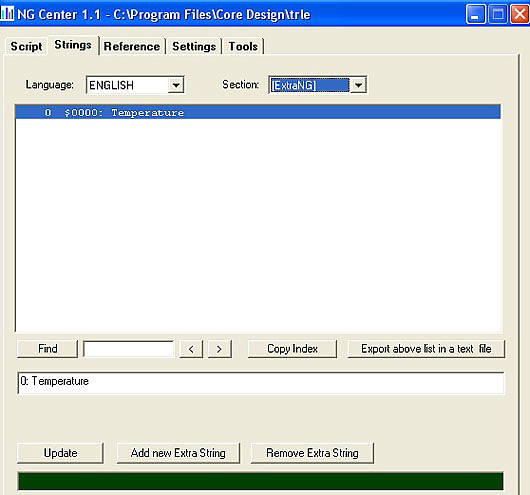 This screenshot shows the Temperature bars title entered into the Ng Scripter. 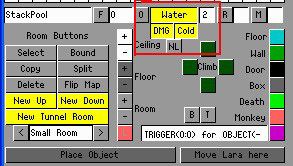 When setting up a cold water room remember to press both the DMG and Cold buttons in the editor as shown here.